One of the great things about not being a national franchise is that our company is free to establish relationships with any vendor we like, rather than being locked into selling one certain brand. This means that we choose the products we sell based on how well they will serve our clients long term, not because a central office told us what we had to sell. Product quality is the best we’ve ever seen in a vinyl window – From the welding of the frame to the digitally-enhanced production of the glass, from the pick-resistant locks to the next-generation insulation – Sunrise windows are in a class of their own when it comes to the materials used to make them. And what really brings it all together are the incredibly skilled craftsmen who use incredibly accurate tools to assemble the final product that goes into your home. We’ve installed tens of thousands of vinyl windows over the years and Sunrise is, hands down, the best we’ve ever seen. Warranty coverage blows past industry standard – Sunrise provides a material warranty that lasts for as long as you live in your home, and it transfers to the next homeowner for as long as they live in the home. We pair this with our labor warranty that lasts just as long, giving you and the people who eventually buy your home complete coverage. You will truly only pay for your windows once when you have us install Sunrise windows for you. Warranty claims are lower than any window brand we have ever carried – As any well-managed company should, we track our warranty claims like a hawk. We want to be sure we are installing products that will serve our clients for life, which means we need to know when our products are letting folks down. Warranty claims on all parts of the window – from glass to locks to spacers – are lower with Sunrise windows than with any brand we have carried in the quarter of a century that we have been doing this. This makes life easier and more enjoyable for you. And, of course, if something does go bonkers, all material and labor costs to make it right are covered. Products arrive on time – Every window we sell is custom-sized for our client’s home. This means that we cannot carry windows in stock (and you should always beware of companies that do). Our windows are manufactured for each job. In the hundreds of jobs we have completed with Sunrise products, extremely few were delayed due to a manufacturing slowdown. Sunrise ships orders to us on time, which means we install them for our clients on time. We have a long-term relationship – As a client, it gives you peace of mind to know that the company installing your windows is on good terms with the company that manufactured them. We have had a stellar relationship with Sunrise for years. Our company is one of Sunrise’s biggest clients in the South and we are poised to continue this relationship for many years to come. This means that your project will run smoothly from beginning to end with no hiccups. 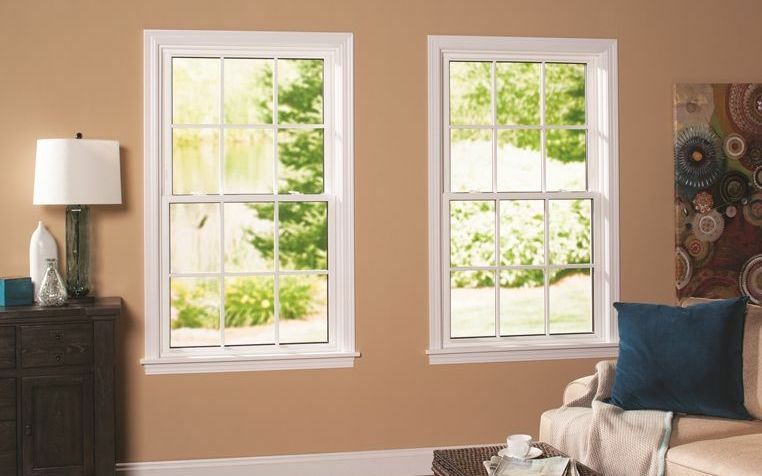 If you are shopping for vinyl windows, Sunrise windows are probably right for you. And if wood is what you’re looking for, we’ve got other great vendors for that. The place to start is with a complimentary consultation where you can physically see and use the products while walking through the design process with one of our award-winning sales consultants. Then you’ll know for sure what’s right for your home. This is all free, so give us a call today at 919-461-0010 to get started!